Host Memory Pressure – I think this is one of the keys (in addition to storage, network, CPU) in performance when running virtualization with dynamic memory and should be monitored. An balance between high density of running VMs on a host and memory calculation/demand is something to consider when managing self service clouds and/or running memory intensive workloads. $Cluster = Read-Host "Cluster Name "
This is just one way to get a total summary per node in your Hyper-V cluster and their configured memory demand. 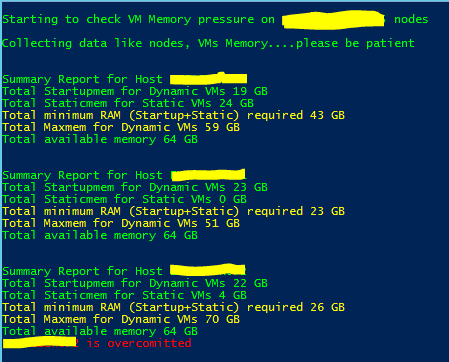 It provides a quick view on memory utilization of your Hyper-V nodes. Be creative and modify based on your needs. Disclaimer: Please read and test script before you run in your production! This entry was posted on June 16, 2014 at 17:33 and is filed under Failover Clustering, Powershell, Virtualization, Windows 2012, Windows Server. You can follow any responses to this entry through the RSS 2.0 feed. You can leave a response, or trackback from your own site.